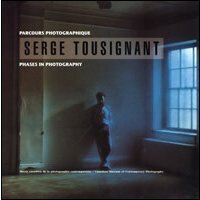 Editor Pierre Dessureault calls Serge Tousignant's work "an endless experiment with the language of art." Formerly a lithographer and engraver, Tousignant "became interested in photography for its qualities of abstraction, composition, time, light, perspective, and geometry." Tousignant experiments with optical illusions, viewer participation in art, and distillation of light and geometric forms. This catalogue is beautifully designed, and presents work from three decades.